Thin and stable 100% polyester structure batting for use in bags, fabric baskets and other stiff fabric crafts. Use in bags, fabric baskets, etc. 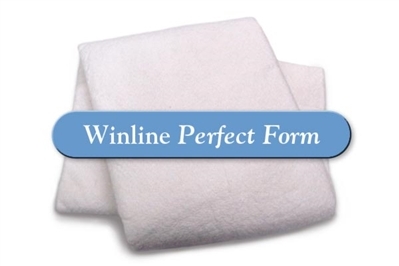 Winline Perfect Form 18" x 60"
Thin and stable 100% polyester structure needle punched batting for use in bags, fabric baskets, and other fabric crafts where a stiff batting is needed. Fibers are thermal bonded to resist fiber migration. Machine wash and dry. 18" x 60"
Winline Perfect Form 36" x 30"
Thin and stable 100% polyester structure needle punched batting for use in bags, fabric baskets, and other fabric crafts where a stiff batting is needed. Fibers are thermal bonded to resist fiber migration. Machine wash and dry. 36" x 30"
Winline Perfect Form 36" x 60"
Thin and stable 100% polyester structure needle punched batting for use in bags, fabric baskets, and other fabric crafts where a stiff batting is needed. Fibers are thermal bonded to resist fiber migration. Machine wash and dry. 36" x 60"